In our previous posts, we’ve discussed different tools and apps which are very useful for marketers, startups and entrepreneurs. 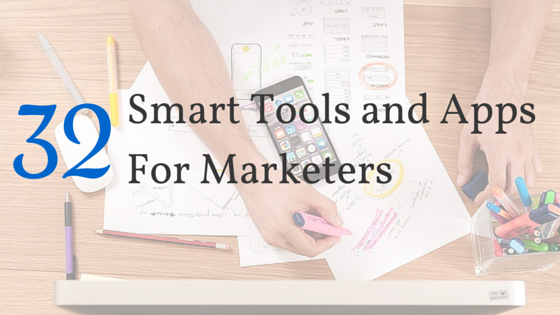 Here’s a checklist of some smart tools and apps. You can easily schedule meetings and invite participants from any device at any time. Empower your team with in-browser video and audio conferencing without additional hardware. Gain valuable insight into the performance of your website from actual visitors to deliver a better experience. Do great things together. Connect, engage and accomplish more with social cast. Bring people, information, and ideas together in one place, and watch productivity soar. Team productivity software that helps your team get work done. Asana puts conversations & tasks together, so you can get more done with less effort. Do great things with asana. Work from everywhere. Analyze websites, track social media, build backlinks – Ahrefs has you covered. Try Ahref’s marketing and SEO tools site explorer and content explorer today! Keyword planner is a free tool that helps you by finding keyword ideas and estimating how they are perform. Just enter a keyword or group of keywords. With the world’s best sources organized into thousands of topics, it’s a single place to follow the stories and people that matter to you. Edgar is the only app that stops social media updates from going to waste. Edgar allows you to set routines for republishing your past content. A better way to easily publish content from any RSS feed to Twitter with beautiful imagery in each and every tweet. Lead Converter helps you capture more leads to increase conversions and revenue. Promote products, events and news in a smart way. Display personalized message at the right time. Grammarly makes you a better writer by finding and correcting up to 10× more mistakes than your word processor. Detect plagiarism by checking your text against over 8 billion web pages. Userium provides a helpful checklist for marketers who want to make sure their website’s up to snuff in terms of usability and accessibility. Create professional quality videos with your photos and video clips within minutes. Create video within minutes, no video editing experience required. Pick a style & song. Make animated videos for business easily. Our themes are carefully-produced sets of matching assets, such as characters, actions, backgrounds, props, and smart sets – each with a unique visual style. Make your own animation quickly and economically with GoAnimate. Free online video editor and maker. WeVideo is a powerful, yet easy-to-use, cloud-based collaborative video creation platform. Whether you are a beginner or a seasoned professional you can create an impactful video with ease. PicMonkey makes creative tools for photo editing and graphic design. Create the most eye-exploding photo you’ve ever made, with online photo editor. Add text, effects, or overlays. Easel.ly is a website that features thousands of free infographic templates and design objects which users can customize to create and share their visual ideas online. Piktochart is easy-to-use infographic creator. Discover how non-designers are creating beautiful infographics in as little as 10 minutes. Build infographic using simple graphic tools. Brands, organizations, artists, and other groups or individuals can create Google+ pages to reach out to followers, fans, and customers on Google. Get Your Ad on Google. Be seen by customers at the very moment that they’re searching on Google for the things you offer. And only pay when they click to visit your website. YouTube is a video-sharing website. In November 2006, it was bought by Google. The site allows users to upload, view, and share videos. You tube has more than 1 billion users. Marketers can’t ignore it as a powerful marketing tool. SocialBro uses a combination of tweet analytics and content optimization to find the tweets your audience responds to most. Analyze, engage & monetize your twitter audience. Simply Smarter Social CRM. Turn Communities Into Customers. Monitor campaigns, analyze results, and create insightful reports in just minutes all within a single platform. Locowise reveals the true value of your social campaign. Don’t forget to share your thoughts or views in comment box! !